This market-leading text provides students with step-by-step guidance through the research writing process, from selecting and narrowing a topic to formatting the finished document. 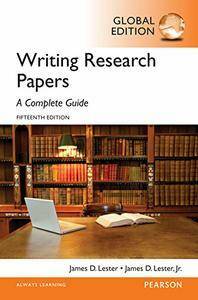 Writing Research Papers backs up its instruction with the most complete array of samples of any writing guide of this nature. The text continues its extremely thorough and accurate coverage of citation styles for a wide variety of disciplines. The fifteenth edition maintains Lester's successful approach while bringing new writing and documentation updates to assist the student researcher in keeping pace with electronic sources. Available in two formats–perfect-bound and spiral-bound with tabs, a handier format at a slightly higher price)–Lester's text is one that students will keep throughout their college careers. MyWritingLab® is not included. Students, if MyFinanceLab is a recommended/mandatory component of the course, please ask your instructor for the correct ISBN. MyFinanceLab should only be purchased when required by an instructor. Instructors, contact your Pearson representative for more information. MyWritingLab is an online homework, tutorial, and assessment product designed to personalize learning and improve results. With a wide range of interactive, engaging, and assignable activities, students are encouraged to actively learn and retain tough course concepts.